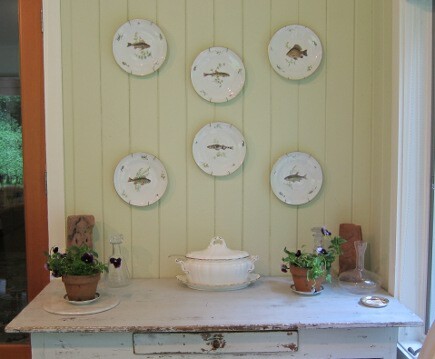 A dining room space that was blank for nine years now features a fish plate wall. 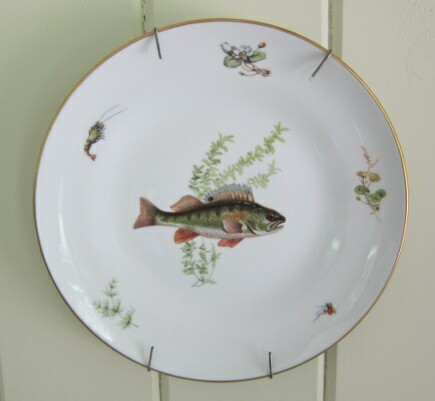 Several years ago, while writing regularly about auctions, I began to notice sets of fish plates coming up for sale at very low prices. This past week I saw another lovely group. 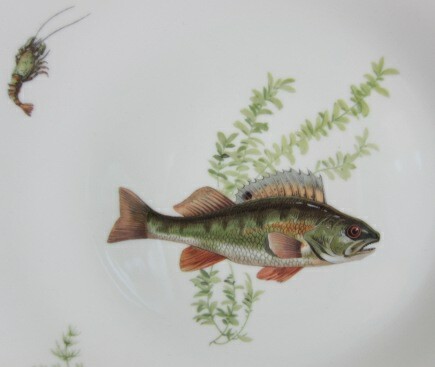 The reason is simple: few people use — or appreciate — fancy fish plates and the last generation that did (mine) no longer use them for food. 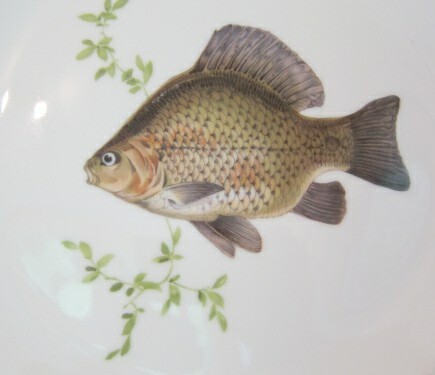 My set of six Italian fish plates from Richard Ginori is so old they’re now true vintage. 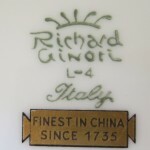 Hint: Ginori is a brand to watch for these days because it’s out-out-out and so is Limoges. I had thought about donating them. 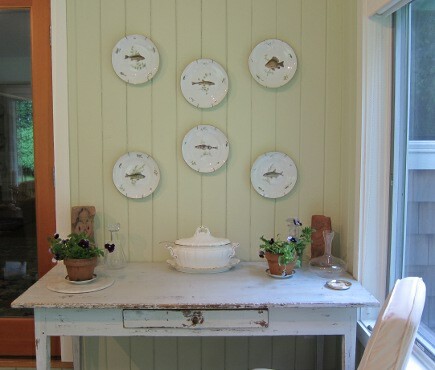 Instead, they become dining room décor on the wall above the side table in our sunroom. But hanging them was superseded by more urgent things since we moved in last June. Now, finally, it’s done. But it wasn’t easy. 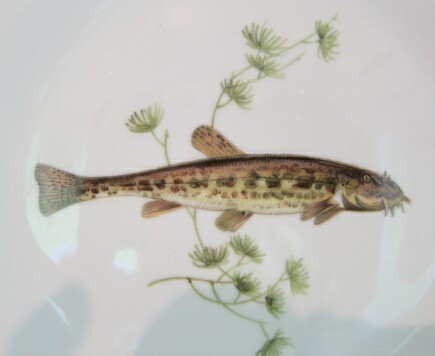 Each plate has a white ground, gold rim and central motif of a different fish rendered in shades of brown and green, swimming in some sea vegetation. As fish sets go, these are very simple, but they are Italian. French brands tend to be more elaborate. Details include small sea critters. I can identify a few of the species (not very important but nice). This one looks like a pike. Given the whiskers, my guess here is a catfish, or a close relative. His fins look a little scary. He resembles a sea bream (dorado), sort of. My first idea for the space was two rows of three but it looked boring. 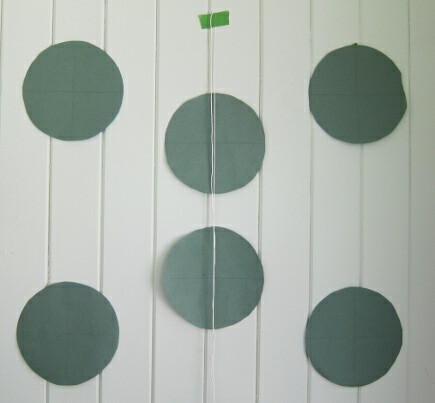 So I made green kraft paper templates marked with a vertical and horizontal pencil lines. I was able to move those around and realized an even number of plates would look best staggered. 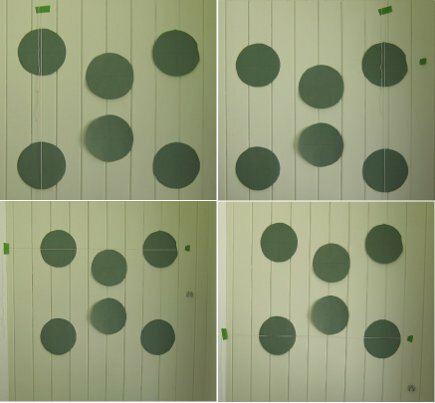 After a few adjustments I realized that if the two middle plates were centered on the wall, the rest could be adjusted from there. It got a bit confusing because the wall is wood paneled and the grooves set up a grid. But I calculated the center point and got two plates aligned perfectly with my trusty plumb line cord. Then I moved the templates to line up right, left, top and bottom and marked the place for the hook by measuring the depth of the loop from the top rim in back. I cut 1-inch long vertical slits above the hook mark so I could nail a hook over each template and slip it off. After the plates went up, I was able to arrange some accessories on the side table. The space had been fairly blank before and I had a smaller table there. (I had painted the base of that small table blue and, for a time, I parked my birdhouse there. But my post on Where Should We Put Our Birdhouse? explored that option, it wasn’t meant to be permanent.) 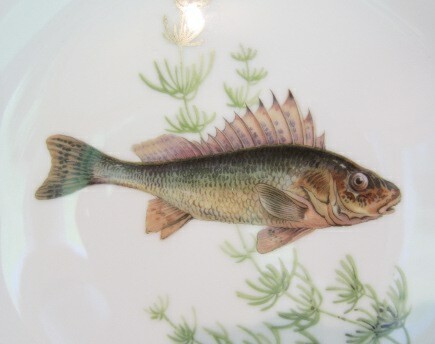 The white soup tureen with gold borders would coordinate well with the fish plates, I guessed. There was no place anywhere else for two small sandstone sculptures Mr. AM brought back from Asia and they provide a rosy contrast. My decanters, wine coaster and marble cheese board have no other logical place to live either. 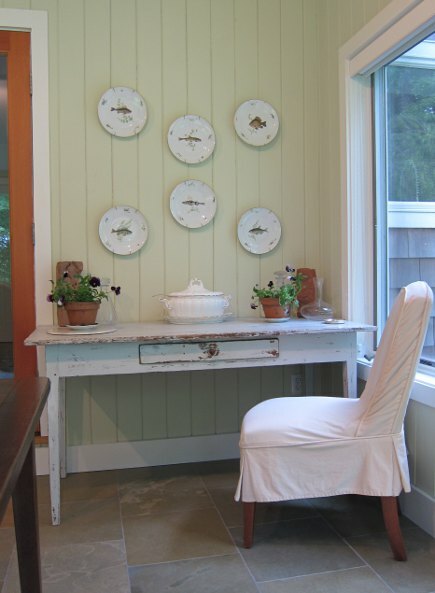 The white-painted antique Swedish table had been my desk for several years and is big enough to be useful when I clear this to use as a sewing table. An extra drawer in the dining room is always handy. I plan to line it with silver cloth and hope that doesn’t take me another year. 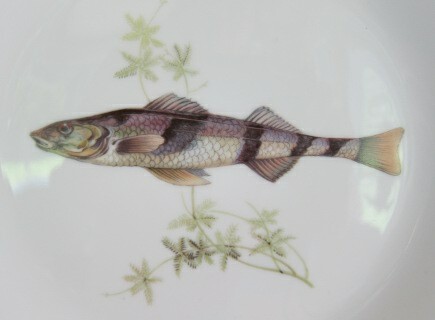 I love fish plates! These are beautiful. They make a fantastic wall display! Now you could be responsible for bringing these great plates in-in-in! Love your plates as decor. I have the same set that belonged to my mother-in-law. I was thinking of putting them up on eBay, but now I know what to do with them. Thanks! Oh wow Patsy. Nice to meet another owner! 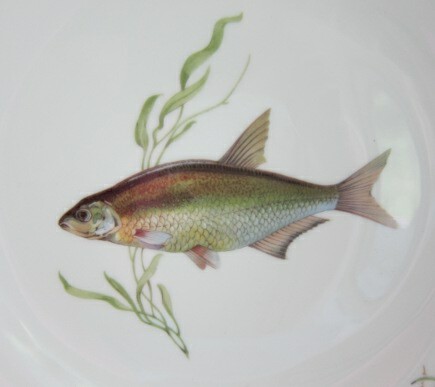 I had thought about selling some dishes on eBay as well because I have nearly as many dishes as shoes. But this way I can still enjoy them without feeling any guilt! Hope you’ll show us a pic of your wall when you get it up.